Adding classic elegance to your holiday tree, this custom brass Christmas ornament features brilliant details in red, green, white and gleaming gold. 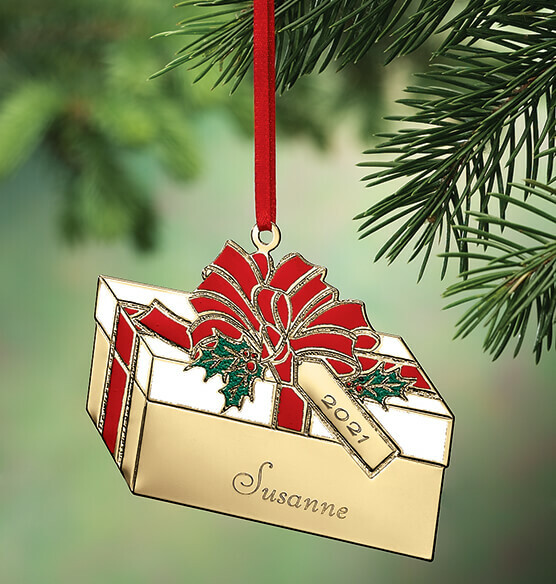 Steel engraved brass Christmas ornament with gold-tone finish and enamel. This present ornament measures 3 1/4" wide x 2 1/2" high. We'll engrave with a name and a year, making it a thoughtful keepsake. Specify name; limit 1 line, 25 letters/spaces. Specify year; limit 4 characters.